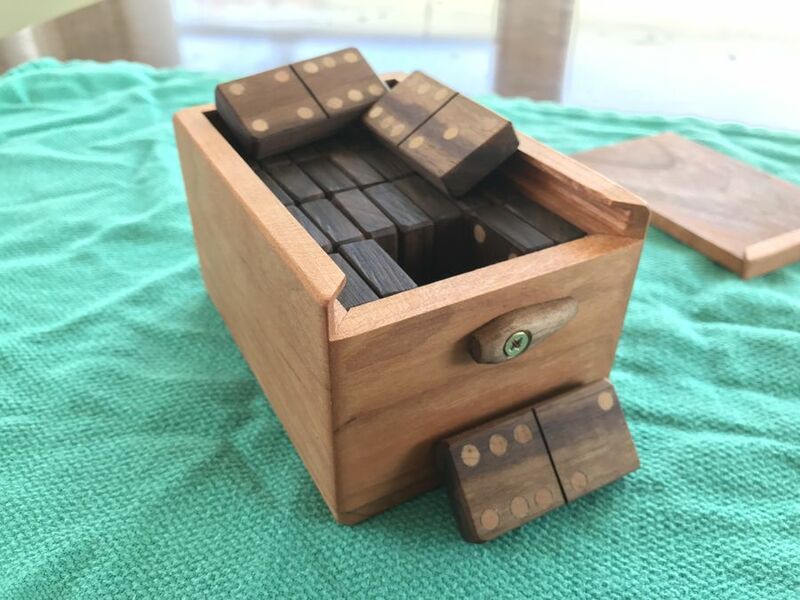 Here is a step by step process of how a made my domino set. 1. 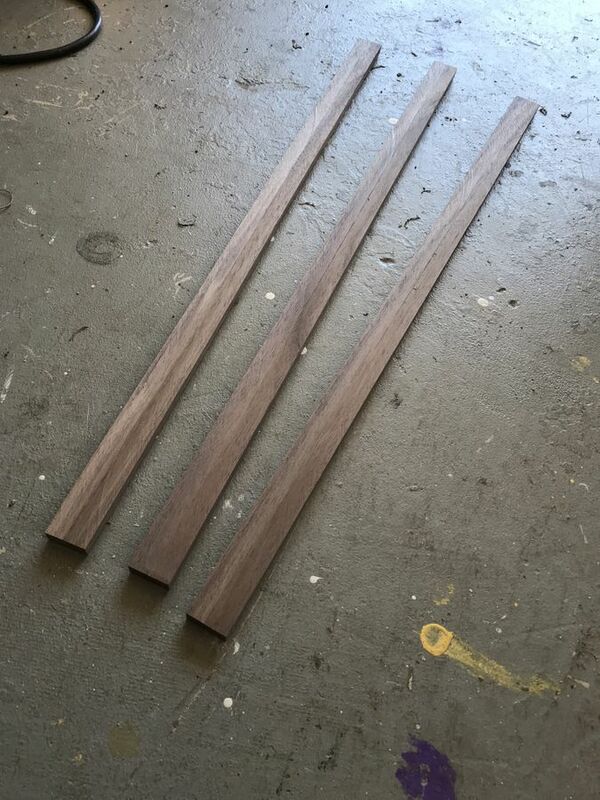 I started by ripping a piece of scrap walnut down to 4 - 1” x 3/8” strips that were roughly 28” long. 2. 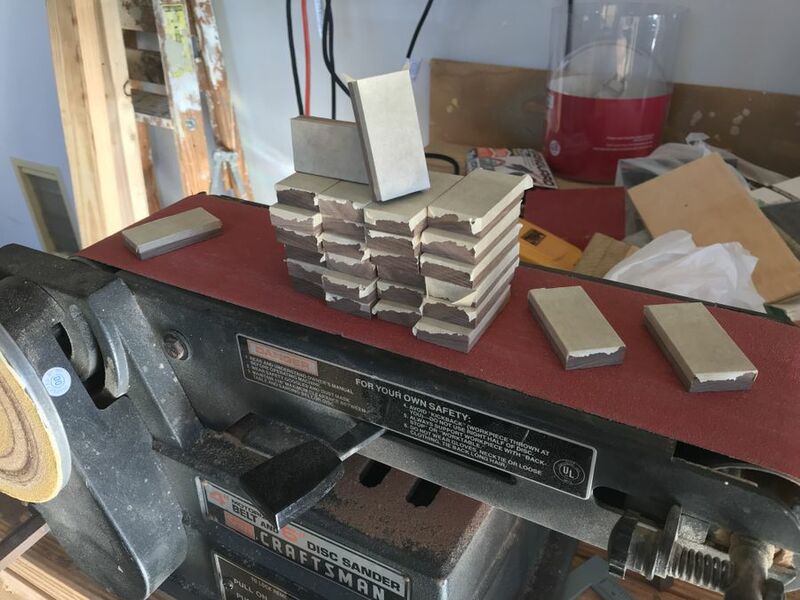 I then lightly sanded the strips on each face to have smooth workable surfaces before cutting them and having sand them individually. 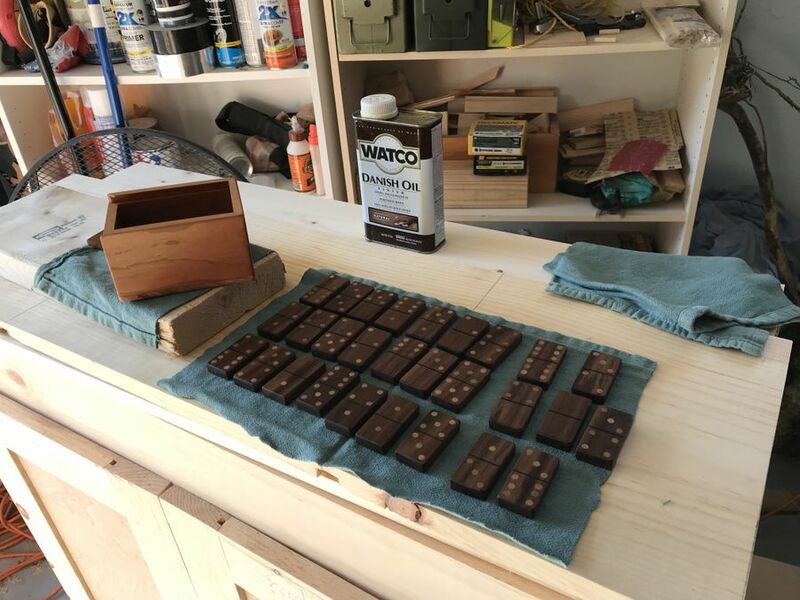 On the side that I wanted to be the back of the domino I drew a line so when I cut them they would each be marked. 3. 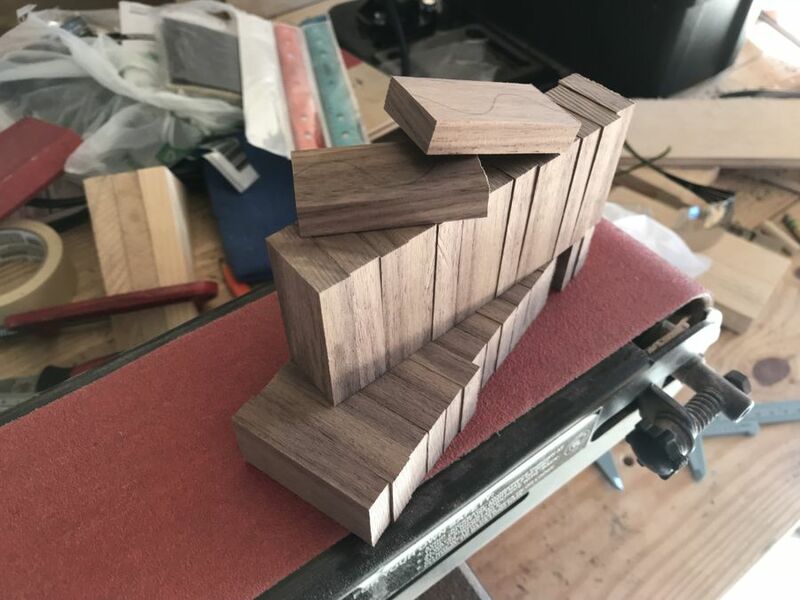 After sanding them I clamped a piece of scrap wood to my bandsaw table that acted as a fence set at 2” to cut each domino blank. 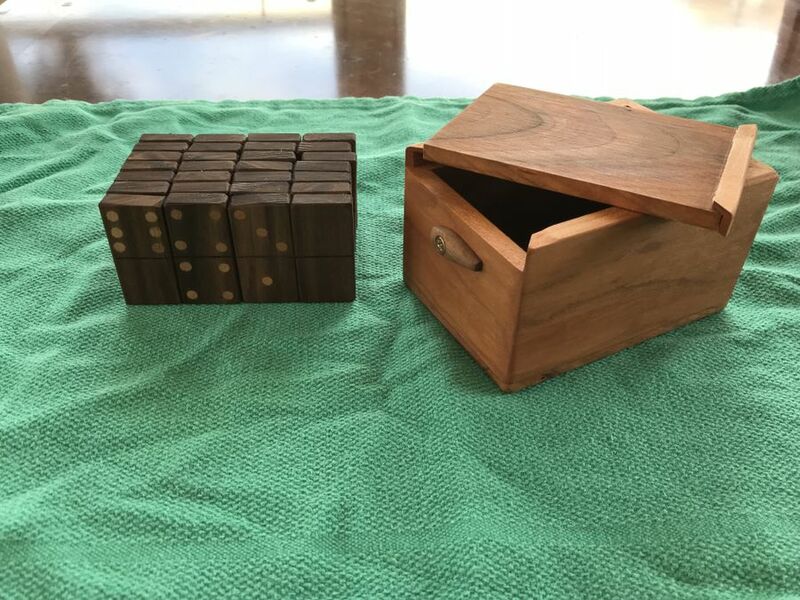 28 pieces in all to make a complete set. 4. 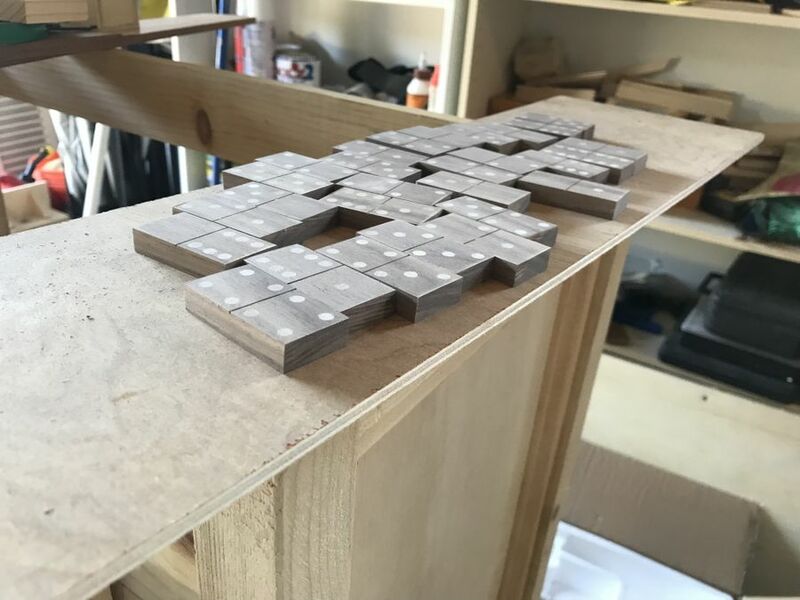 I then taped each face of the dominoes to help limit any tear out from drilling the holes and so I could sketch lines to help placement of the holes. 5. 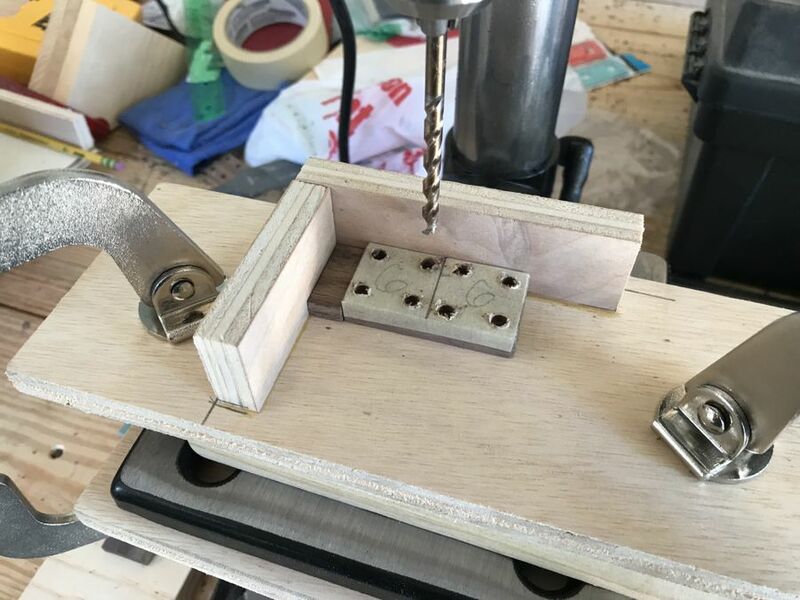 After the taping and sketching was complete I glued together some pieces of 1/2” plywood to act as sort of a jig or template to make drilling the holes with a drill press easier and a little quicker. 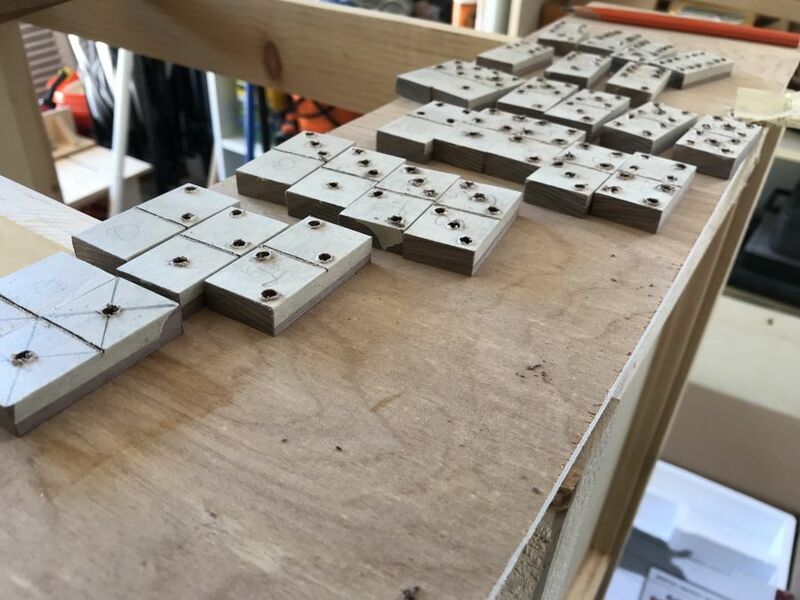 And another jig to line all of the dominoes up to draw a uniform dividing line through the centers of all of them. 6. 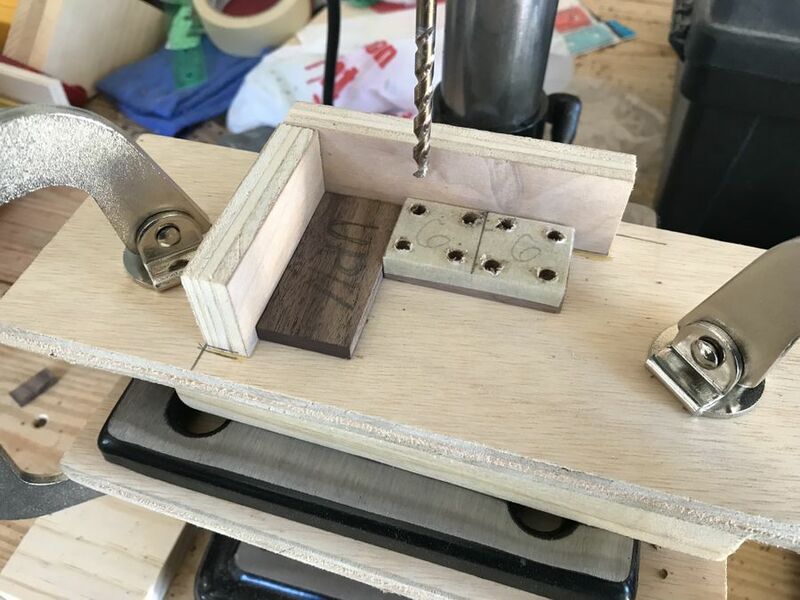 With the dividing lines drawn, I set up another fence and stop block on the bandsaw to saw a small channel to act as the dividing line on each domino. 7. 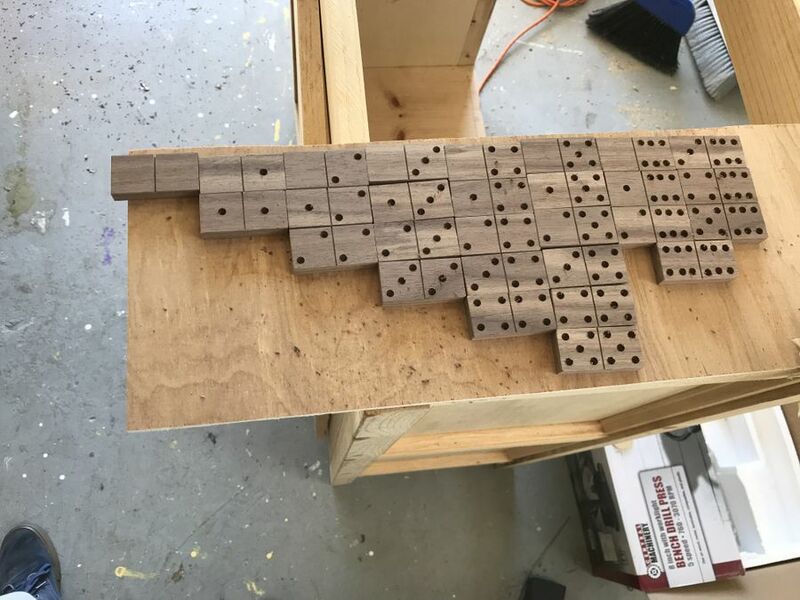 On each domino I wrote the number of holes that would go on each side of the line to make it less likely to drill the wrong amount of holes. 8. 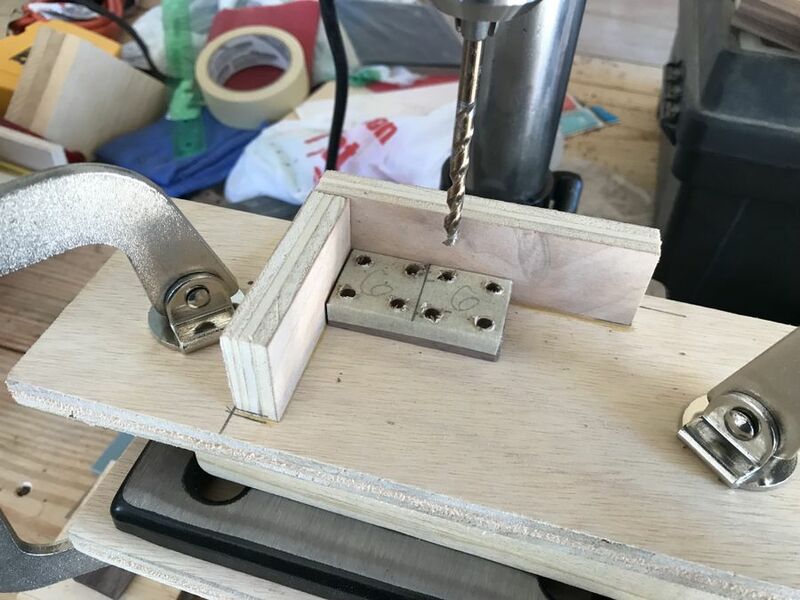 I then began drilling all the holes using a 3/16” drill bit. 168 holes in total! My cheap harbour frieght drill press was definitely not meant to be running for that long as it started to smell overheated. I let it cool down, then back to drilling. 9. After all holes were drilled, I removed all the tape and then lightly sanded again to remove any tear-outs from drilling, I think the tape did it’s job pretty well! 10. 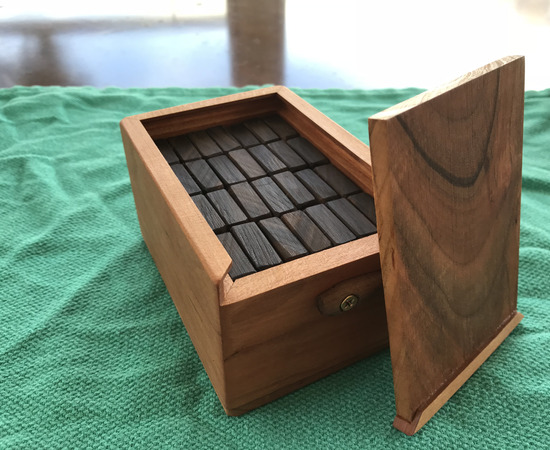 Since I wanted the dots to be contrasted with the darker walnut, I wanted to use pine as the material for the dots. 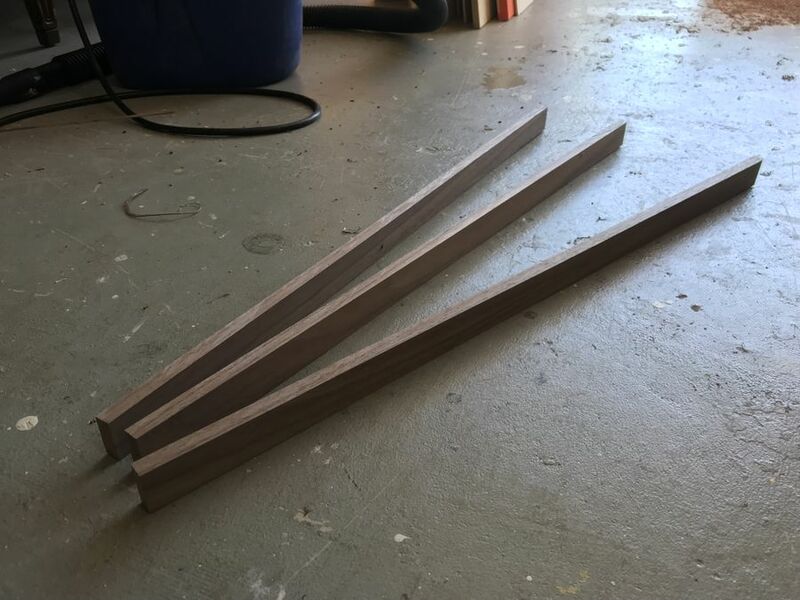 I ordered a pack of 3/16” x 12” pine dowels off of Amazon. 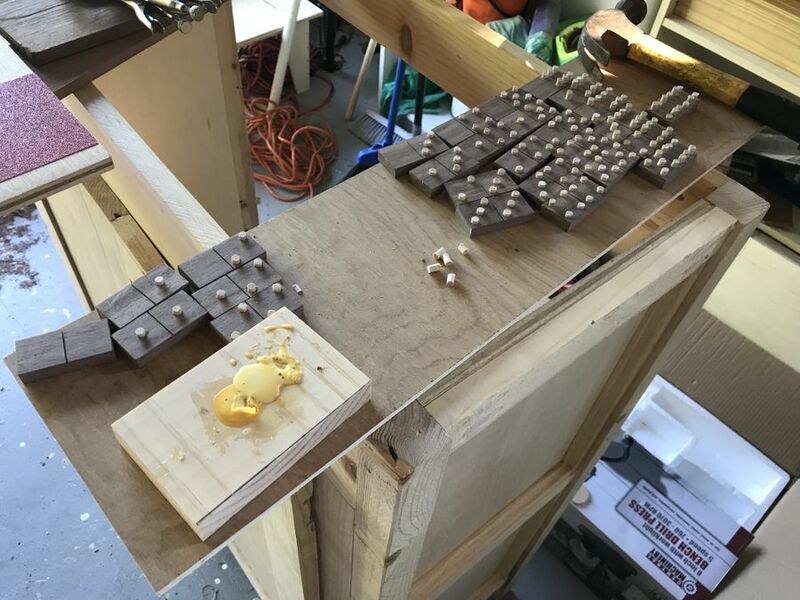 I taped 7 or 8 of them together and began cutting small plugs on my bandsaw. 11. After all the plugs were cut, I began inserting them in the holes I drilled with a tiny drop of glue in each hole. 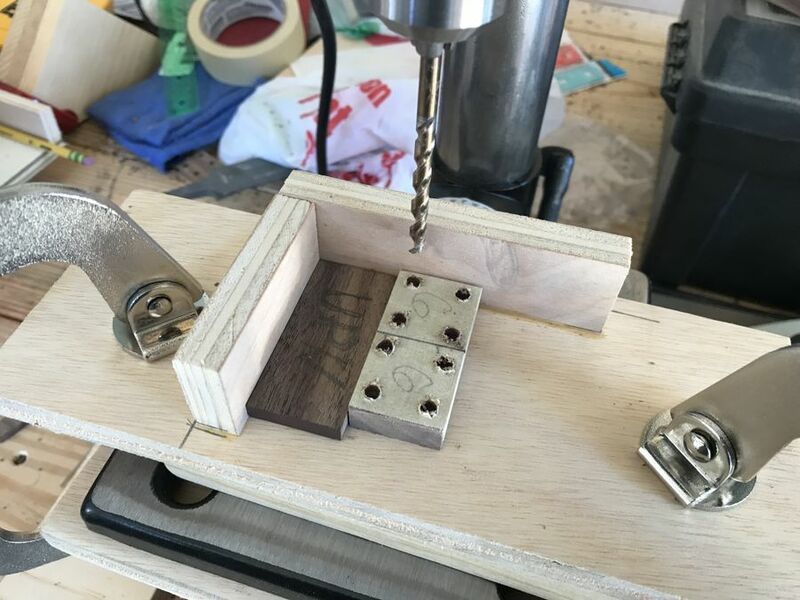 I had a small scrap piece of sandpaper to sand a bevel on each plug to make it easier to insert in each hole. I then lightly tapped each plug home. 12. 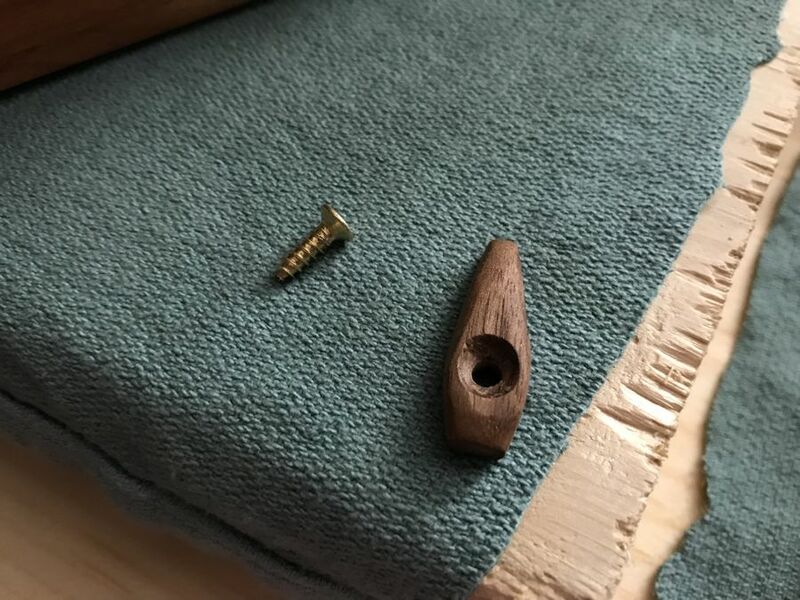 One thing I did not expect was the pressure built up by the plugs being tapped snugly into the hole with a little too much glue in it caused the walnut to crack and glue to squirt out. 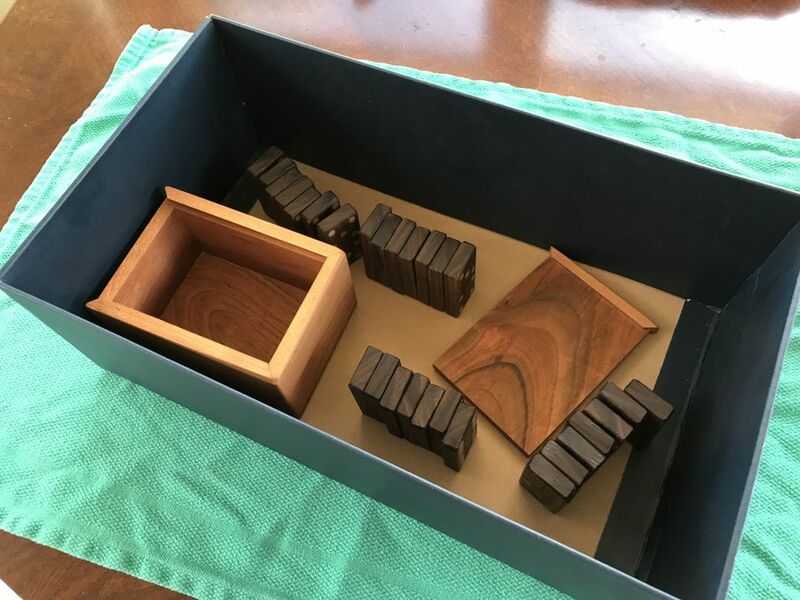 But since that meant that each crack was sufficiently coated with glue I just lightly clamped the 3 or 4 dominoes that had cracked, and all was good. 13. 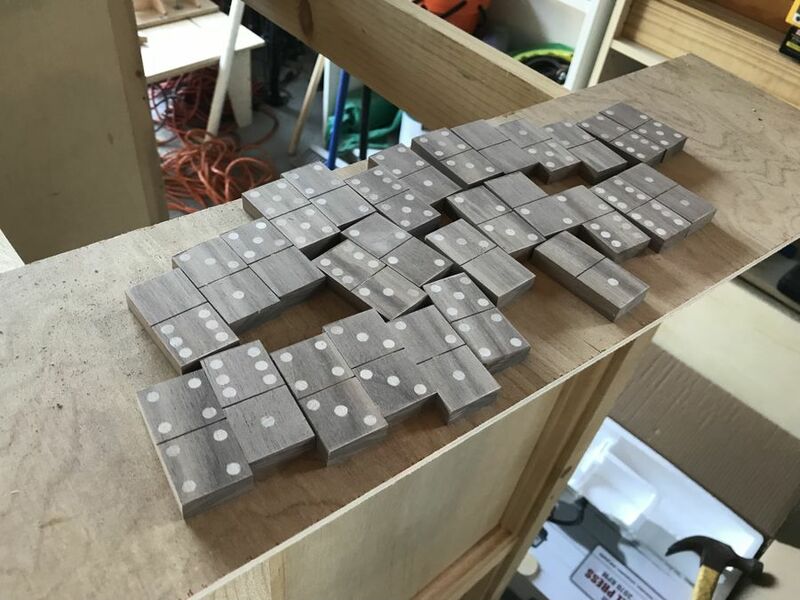 I let the dominoes sit for an hour or so and took them all to the bandsaw again to cut the excess dowel off of each domino. Then sanded flush using an 80 grit sanding belt on my belt sander. I then changed the belt to a 220 grit and smoothed the surfaces and rounded the edges and corners. 14. 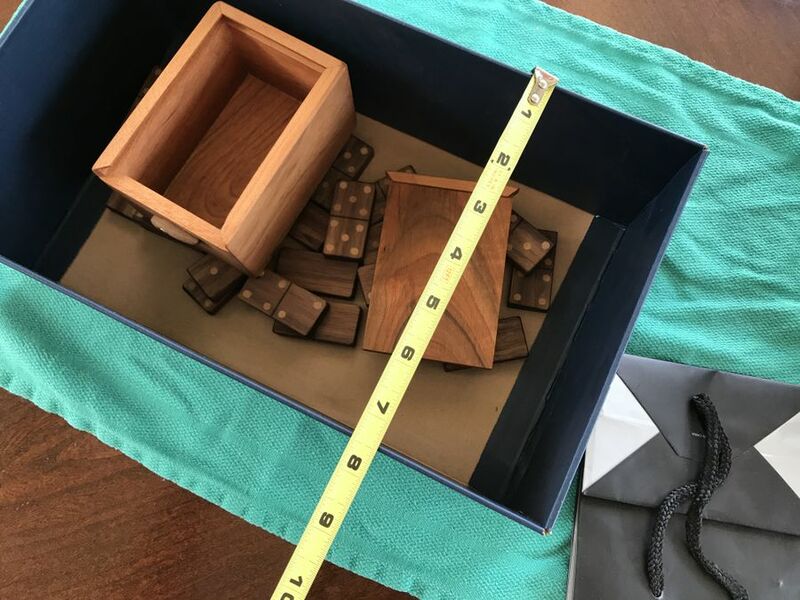 The second part of the project was the box to hold the set of dominoes. 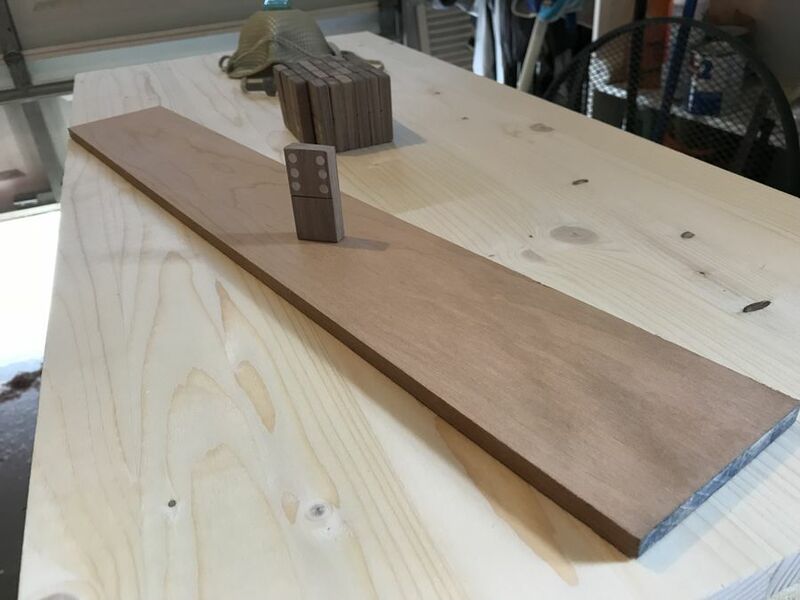 I started with a scrap piece of cherry about 1/2” thick and measured the stack of dominoes to ensure a snug fit. 15. 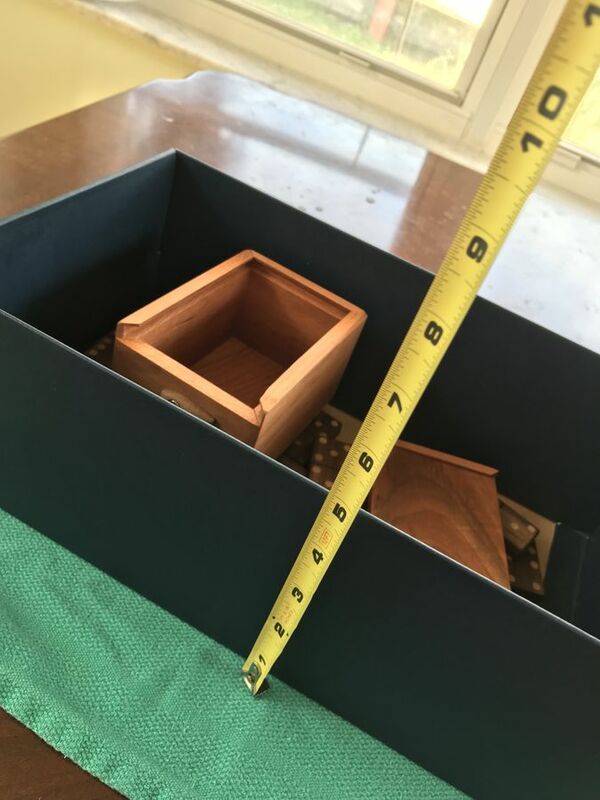 This part I forgot to document with pictures, but I cut the four sides with 45 degree miters then ran them through the table saw to get a dado on the inside to accept the sliding lid. 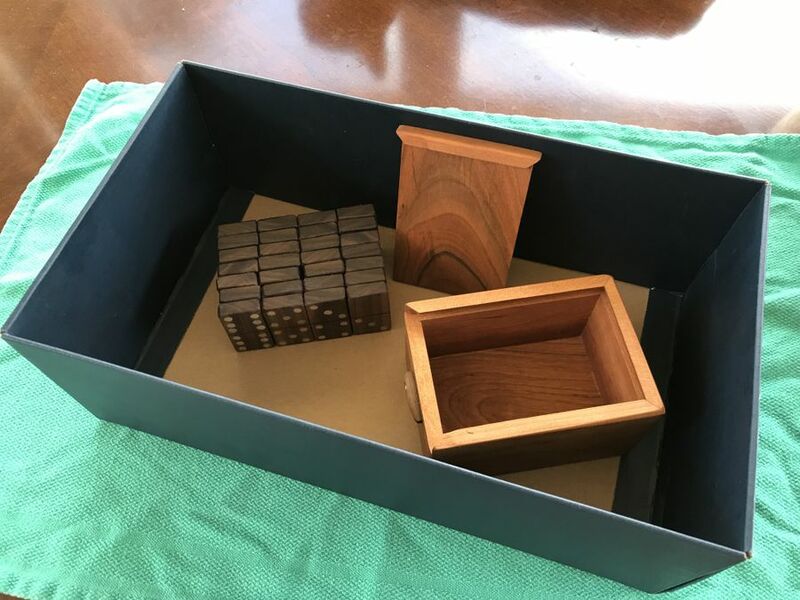 I cut the front wall of the box shorter also to account for the lid. 16. 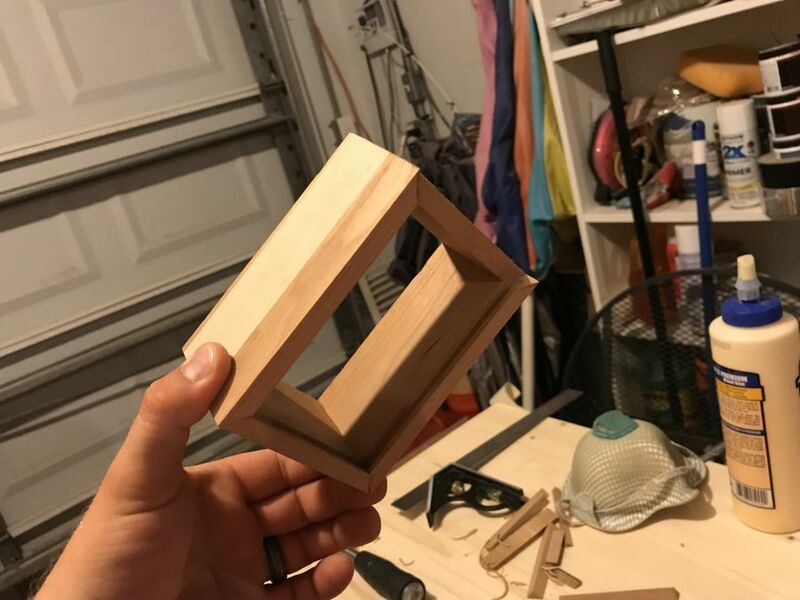 I glued up all the sides using tape to hold them in place, and then glued the bottom on and clamped to hold in place. After the glue had dried I sanded all the sides and edges flush using the 80 and 220 grit sanding belts, then rounded all the corners and edges. 17. 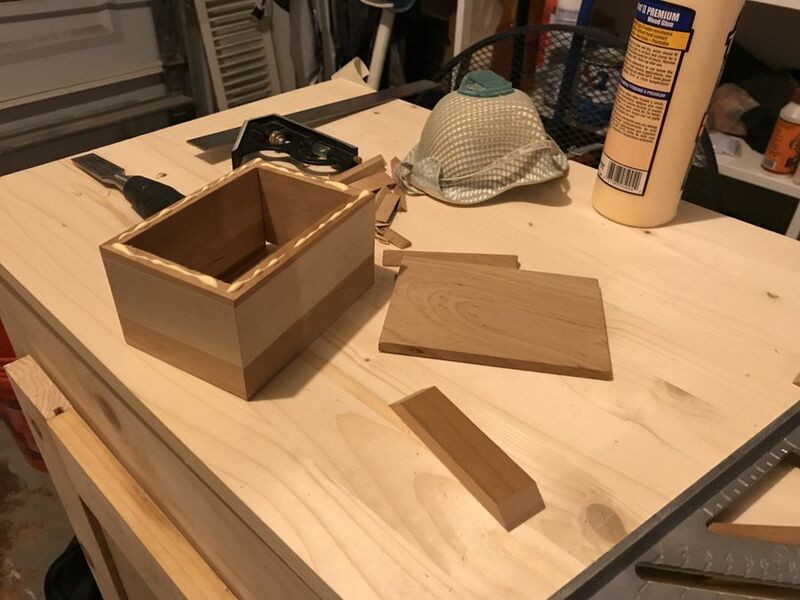 I then glued a mitered trim piece to the end of the sliding lid and ensured a tight fit by way of sanding and rounding. 18. 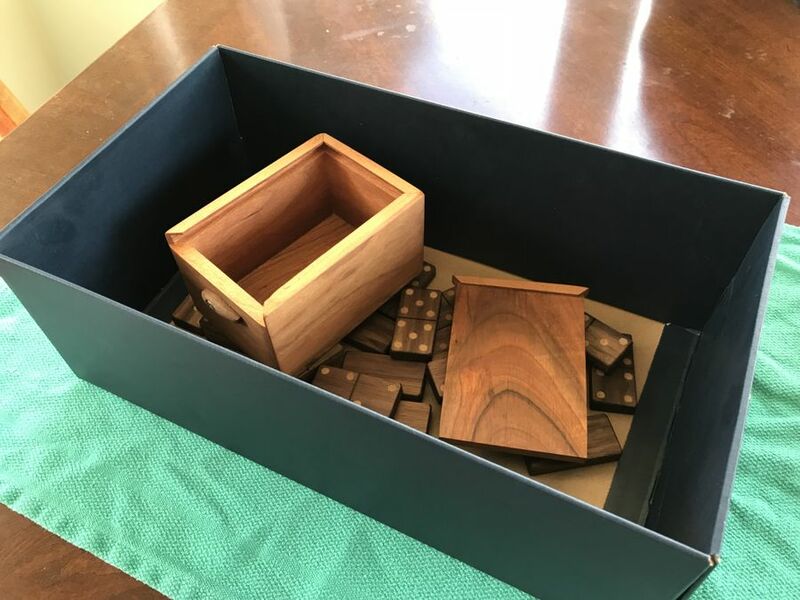 The final step of building the box was to create a locking mechanism so the lid wouldn’t slide off and spill all the dominoes. 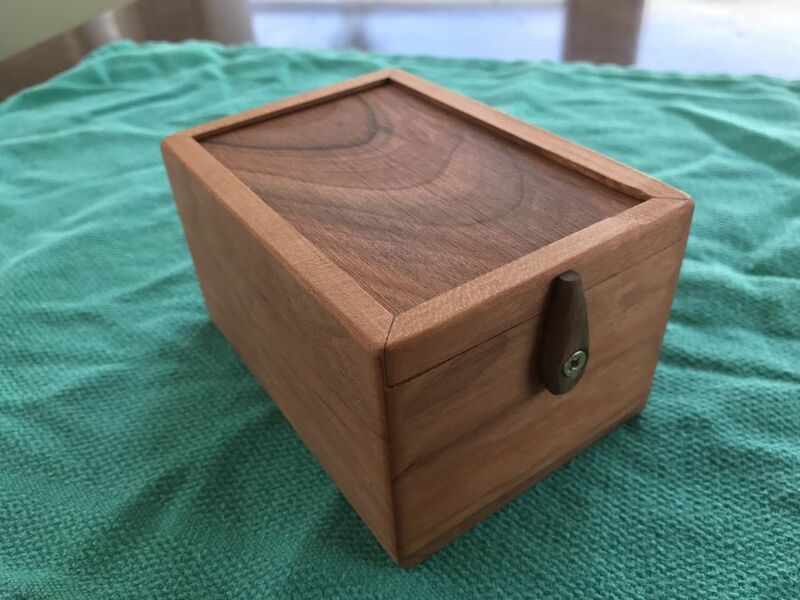 I made this out of scrap walnut and drilled a hole for the screw and the rounded on side while leaving the other flat. 19. 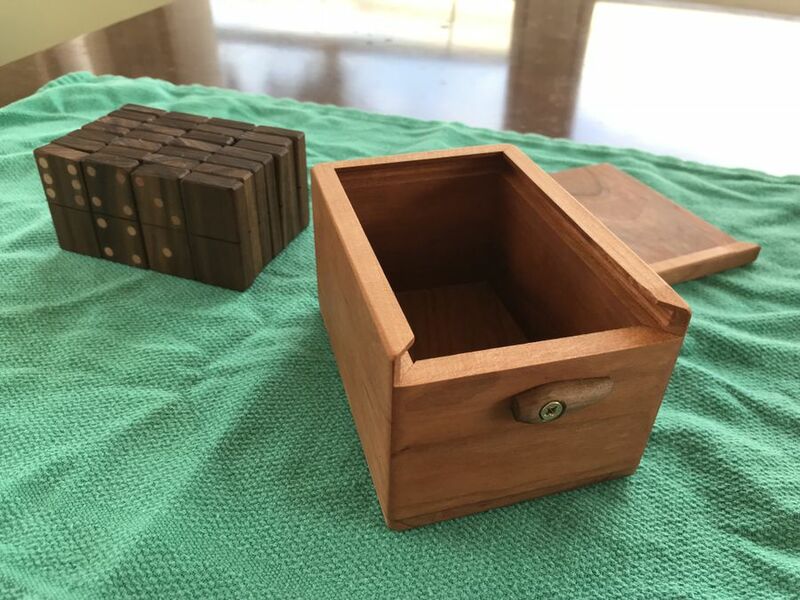 To finish this project, I applied two coats of danish oil to all the dominoes, the box, and closing piece. 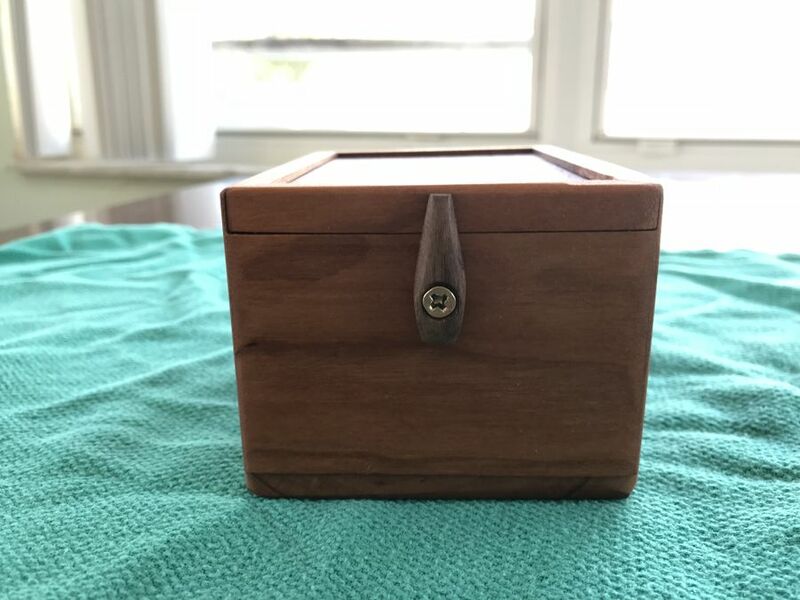 I then drilled a nerve racking hole in the front of the box, attached the closing piece and was finally done! 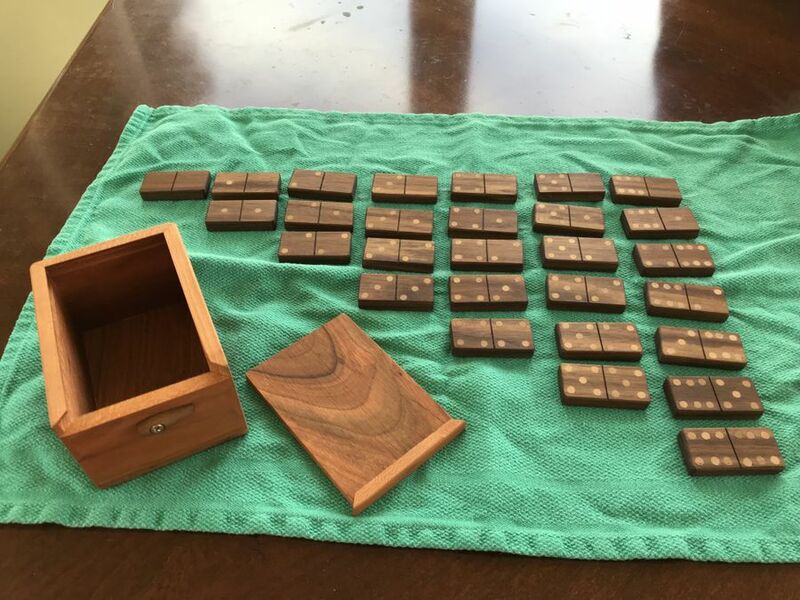 This domino set is a double six set, containing 28 standard sized domino tiles made out of walnut, and a storage box made out of cherry. 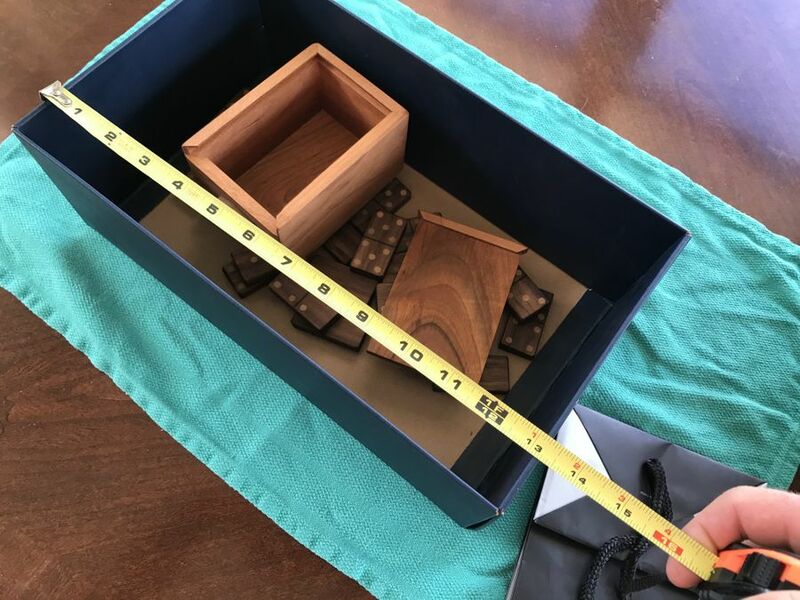 The shoe box I used for proof of size is 13 1/2” x 7 1/2” x 4 3/4”. Awesome job on the domino set! Thanks for sharing. Cool project. I don't play dominos but I know a few that do. Maybe a future present.... Thanks for sharing.